The Use Service tab of the TAP load dialogue displays information about the service you have selected to query, including what tables are available and what columns they contain, and allows you to enter the query text and some additional options about how the query is to be executed. The panel has three parts: Metadata, Service Capabilities, and ADQL Text. 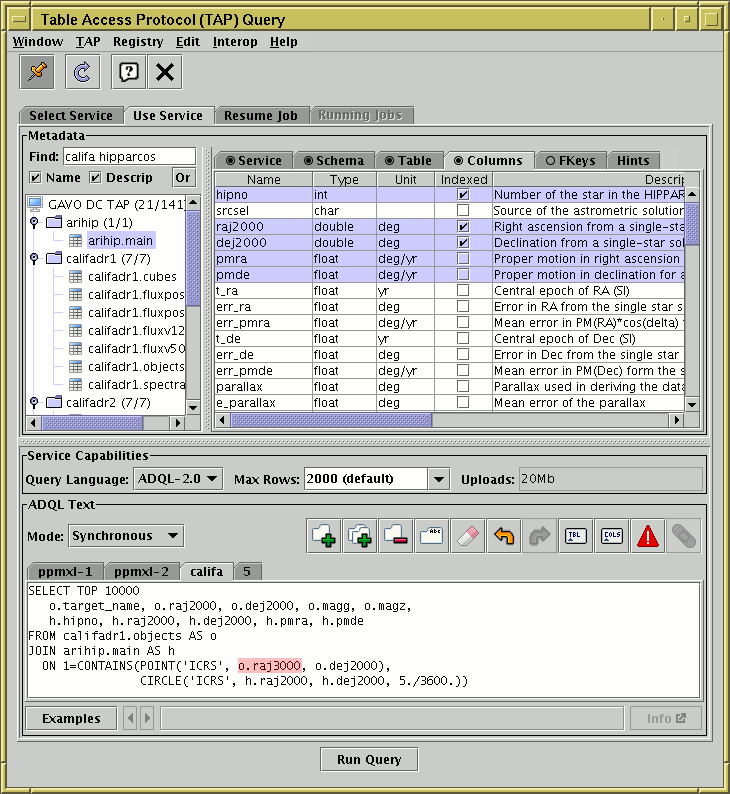 The Metadata panel displays information about the tables held by the selected service. On the left of the panel is a searchable tree summarising the schemas and tables in the service, and on the right are some tabs containing more detail. Note all this information has to be loaded from the server, so in some cases you may have to wait before it is visible. The tree on the left contains a listing of the service's Schemas, and under them the Tables they contain. A Schema in this context is just a subject grouping that contains one or more tables. Each schema notes in brackets the number of tables it contains; you can reveal or hide the tables by clicking on the schema node's handle. If the service contains only a small number of tables it may be convenient just to scroll up and down to see them all. But for services with hundreds or thousands of tables, you may need to restrict the displayed tables to those you're interested in. To do this, type one or more search terms into the Keywords field. The nodes displayed in the tree will be filtered to include only those that match the search terms as you type them. The Name and Descrip checkboxes indicate whether you want your search terms to match tables/schemas by name and/or by description. The And/Or toggle button determines whether each displayed table/schema has to match all of the search terms or just one. So for instance if you want to list just two tables, you can type in both table full names, uncheck the Descrip control, and set the toggle button to "Or". Provides various items of information about the TAP service itself, gathered from the service and its registry record if available. This includes the service's name, Service URL, Reference URL, curation and contact information, detailed description, declared data models, and listing with description of any service-specific User-Defined Functions it supports. This may provide some useful reference information for writing queries (available UDFs especially). If a Reference URL or Examples URL are provided, clicking on the URLs or the little link icon ( ) in the panel will try to open the relevant pages in an external web browser (or you can copy and paste them yourself). The content of this tab is not sensitive to which node of the tree is currently selected. Provides a textual description of the currently selected schema, or the schema of the currently selected table. A schema is just a higher-level grouping of tables within the TAP service. Depending on how the service has arranged its tables this may or may not provide useful information that's not available at the table level. Provides a textual description of the currently selected table (if any). Tabulates a list of all the columns in the currently selected table; column names, data types, units, descriptions, UCDs, and possibly other metadata are shown. This is generally the information you will need to know about a table before you can write queries. You can sort the entries by clicking on the column header (clicking cycles between ascending, descending, and unsorted), so for instance to list the columns in alphabetical order click on the Name column header, or to group together all the columns with units of mag click on the Unit column header. If no table is selected in the tree, this tab will be empty. If the service provides information about foreign keys (links between fields in different tables in the database) they will be tabulated here for the currently selected table. If any are present, they may help you to formulate efficient queries. If no table is selected in the tree, this tab will be empty. This panel gives you a very basic "Cheat Sheet" for writing ADQL queries. There are just a few hints to jog your memory about the required syntax for some common operations. But the very best advice it gives you is to use the Examples menu, and the service-provided examples (from the Examples menu or via a link) if available. Shows what query languages, and what versions, are available. If there is more than one listed, you can choose which language you want to submit your query in, but if you choose something which is not a variant of ADQL it may not work. Selector which shows the maximum number of output rows that the service is willing to deliver as the result of a query under normal circumstances. Entries in this list value may be marked "(default)" or "(max)". You can change this value by typing in a different number, as long as it does not exceed the server's maximum. This value is here to protect the user, as well as the service, from inadvertently requesting an unduly large output table. Note that if the construction "TOP nnn" is used in the ADQL, the nnn limit may override the value supplied here. Indicates whether table uploads are permitted, and perhaps what is the largest upload size (in terms of rows and/or bytes) which will be accepted. See below for more about table uploads. Provides the following options to control how your job is executed: Synchronous, Asynchronous or Quick Look. Synchronous means that TOPCAT sends the query to the server and waits for the result as the response of the same HTTP request. It's simpler and faster than async, but if the job takes a long time, the request may time out and the results be lost. Asynchronous means that TOPCAT sends the query to the server and gets a message back telling it where to look for information about the job's progress; the application then keeps polling the server to find out when it has completed. Quick Look runs the query as for Synchronous mode above, but when the result comes back it is just displayed in a new popup window rather than loading it into TOPCAT for further analysis. Synchronous mode is suitable for short jobs (it may typically execute with a few seconds less delay), but for longer jobs aysnchronous is more reliable. It is possible to submit an asynchronous job on one day from one machine, and pick up the results on a different day from another machine, using another invocation of TOPCAT or of a different application altogether. Quick look is good if you just want to see the result but don't want to do any detailed analysis of it. One example is if you just want to know the number of rows in a table (SELECT COUNT(*) FROM table); the result of the query is the row count in a one-column, one-row table, and there's not much point loading that table into TOPCAT. Adds a new blank editing tab, so you can start editing a new query without affecting any existing ones. Adds a new editing tab with text initially copied from that in the currently visible one. Deletes the currently visible tab. Sets the title of the currently visible tab. By default the titles are consecutive integers (the first is "1", the second "2" etc), but you can give them more meaningful names if you like. Erases all the text in the currently visible tab. The text can be retrieved using the Undo action. Undoes the most recent editing action in the currently visible tab. You can do the same thing from the keyboard using Ctrl-Z. Reverses the most recent Undo action in the currently visible tab. You can do the same thing from the keyboard using Ctrl-Shift-Z or Ctrl-Y. Inserts into the text at the current cursor position the name of the table (if any) that is currently selected in the metadata tree above. This is a convenience that may save some typing, especially for long or complicated table names. Inserts into the text at the current cursor position a comma-separated list of the names of any columns that are currently selected in the Columns tab of the Metadata panel above. In order to select columns, click on the rows in the Columns panel; you may need to hold down the Ctrl key while clicking or something similar (depends on your OS) to select more than one. Columns are inserted in the text in the order they were selected. This is a convenience that may save some typing, but note that you may still need to edit the inserted text, for instance to add table name/alias prefixes. If this button is enabled, it means that the parser has detected an error in the currently visible ADQL text. The error will usually be highlighted in pink in the editing panel. Clicking this button pops up the actual parser error message, which may give you more idea what's wrong. These actions are also available from the Edit menu. This panel is where you type ADQL text that forms the query to send to the TAP service for execution. The Edit actions described above, along with Undo/Redo actions from the keyboard, can also help. You can have multiple queries on the go at once in different tabs; add/remove/retitle tabs with the toolbar actions, and move between them by clicking on the tab headers at the top. The tab you can see is the one that will be executed if you hit the Run Query button. As you enter the query text, it will be checked for syntax errors. If an error is found, the place in the text which appears to have caused it will be highlighted in pink (as in the figure above). To see more detail on the error, click the Parse Errors ( ) button. The checking itself is reasonably reliable, but the position of the highlighted error, and the text of the error message, can sometimes be a bit misleading, so don't take the details too seriously. The error highlighting is just used as a warning, you are not prevented from submitting a query marked as erroneous, since in some cases TAP services may accept ADQL which is not strictly correct, and in some cases the error checking may not be perfect. Note also that for various reasons the service may not be able to accept all queries that count as syntactically valid ADQL, so even if TOPCAT doesn't report any errors, the service may still respond with an error message. Clicking on the Examples button at the bottom left of the panel will pop up a menu that allows you to select from a number of example ADQL queries. If you select one, the relevant ADQL text will be pasted into the editing panel; you should be able to hit the Run Query button straight away and execute it to get a result. In some cases the example text is influenced by the table you're currently looking at in the metadata panel. Until you are experienced with ADQL, starting from one of these examples and editing it to taste is often a good way to write a query of your own. Basic: Basic examples that should be applicable to most services. Upload: Examples that involve uploading a tables from TOPCAT to the TAP server and executing queries using it. Only enabled if the service supports table uploads and at least one table is currently loaded into TOPCAT. Service-Provided: Examples provided by the TAP service. These are likely to provide some insight into the kinds of query that make sense and make good use of the particular tables available from the service, so it is often instructive to look at these. Only enabled if the service actually provides some examples (at time of writing, not many do, but hopefully this will improve). Note to TAP service implementers: at time of writing, there are two variants of the standard way for services to provide examples (DALI sec 2.3 and TAPNotes sec 4.2.1), and it's not clear which is preferred. For now, TOPCAT will recognise either. TAP_SCHEMA: Examples using the tables in the TAP_SCHEMA schema, which describes metadata about the tables in the service. You can use these to do things like count tables or columns in the current service, or locate tables with columns having particular physical meaning. ObsTAP: Examples using the IVOA ObsCore data model (ivoa.obscore table), which describes astronomical observations in a standardised way. You can use these to do things like search for all observations at a particular sky position, or observation time, or waveband etc. Only available if the service declares support for the ObsCore data model. RegTAP: Examples using the IVOA RegTAP data model (tables in the rr schema). You can use these to do things like search for all TAP services containing tables having columns with particular physical meanings, or all cone search services relating to particular wavebands, etc. You can use queries like this to perform more sophisticated searches for TAP services than you can do using the Select Service tab. Only available if the TAP service declares support for the RegTAP data model (i.e. if it hosts an IVOA searchable registry). When you select an example from one of the sub-menus, its name and title will be displayed to the right of the Examples button. Little left and right arrow buttons allow you to cycle through the examples in the current submenu so you can browse what's available. Some examples come with additional explanation on the web. If the example you're currently looking at has such additional documentation then the Info button to the right will be enabled, and clicking on that should open the relevant page in a browser on your desktop. Some TAP services permit Table Uploads. What this means is that you can upload tables from TOPCAT into the remote database and perform queries on your table directly. In this way you can perform joins between your own tables (anything loaded into TOPCAT) and any of the tables in the remote database. This is an extremely powerful feature. To take advantage of it, you just need to use a special form for the table name to reference a TOPCAT-based table: you write "TAP_UPLOAD.t<n>", where <n> is the ID number of the table in TOPCAT, that is the number before the colon in the Control Window Table List. So, if a table identified as "1: messier.xml" in the table list, you can reference it in ADQL as "TAP_UPLOAD.t1" - see the Upload sub-menu of the Examples menu described above for some examples. Note the table uploaded in this way is the Apparent Table corresponding to the given ID number, i.e. current subset and column selections apply. It's a good idea to ensure that any table you are uploading has columns with sensible names, otherwise the service may rename the columns or otherwise have trouble handling it. Having entered suitable query text, click the Run Query button at the bottom of the window to submit the job. What happens then depends on the Query Mode described above: in Synchronous mode, the Load Window will appear with a load progress indicator, and when it's done the table will be loaded into TOPCAT in the usual way. In Asynchronous mode, you will be taken to the Running Jobs tab where you can see the progress of your submitted job; when it's ready it will be loaded into TOPCAT. In Quick Look mode, a window will pop up to display the results when they are ready.